I apologize todays layout is a day late. I spent the day cleaning and reconfiguring our rec room because we have some furniture being delivered today. Then went over to my parents place for dinner. It was a very busy day yesterday. I'm very excited about the new couch and love seat we are getting today EXCEPT that we are having 35 family members over on Boxing Day and I'm a little concerned with that many people that something is going to get spilled on it. We were told that we will get a call from the company that takes care of the 'scotch guarding' but I think I may have to contact them and see if I can make arrangements to get them here before the 26th. Otherwise I am going to be paranoid the whole time. Anyway, on to the real reason you are here - todays project. This layout uses the O from the Glittered Ho Ho Ho chipboard, as well as many new products that will be available beginning January 5th. 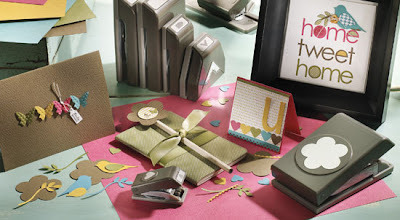 The designer series paper in the centre of the O is our Sending Love Specialty paper. This paper is gorgeous! Each sheet has a glittery design on one side. It also uses a little love note and glassine envelope. The love notes will be available in two sizes/shapes - this particular one is the Kisses. I can see myself using these lots for journaling on scrapbook pages and then tucking them in the glassine envelopes. The stamped image on the envelope is from a new set called Messages for Mom and lastly did you notice the corners?! Stampin' Up! is introducing a new punch design - take a look! They are introducing 7 new punches plus one in the Sale-A-Bration mini. So are you excited?! If you'd like to try them out, be sure to mark your calendar for January 16th. I will be having an Occasions Mini/SAB open house where you will be able to try out all the new product! There are so many exciting new things - you won't want to miss it! I will be back tomorrow with another exicting new announcement!